UPDATE: Samsung 5.3in Galaxy Note smartphone to launch in UK on November 17 | What Hi-Fi? 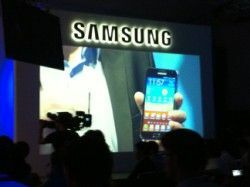 Samsung's Galaxy Note smartphone, first seen at IFA in Berlin last month, is due to go on sale in the UK from November 17th. None of the major mobile networks have yet confirmed if they'll stock the Note, but we'll bring you any further updates as soon as we get them. Let's hope Apple doesn't throw a spanner in the works again and demand a sales ban on this one too. Samsung has announced the Galaxy Note today at IFA, a new category of portable that hopes to bridge the gap between tablet and smartphone. Boasting a 5.3in HD screen, the Galaxy Note has a familiar touchscreen display but can also be controlled with the new S Pen stylus. It's 9.65mm thin, 14.6cm tall and 8.2cm wide, with a 1280 x 800 HD Super AMOLED screen. An Android tablet, it uses the Gingerbread 2.3 operating software and has a 1.4GHz processor. It's compatible with 1080p/24fps HD video, while MPEG4, DivX and WMA video files, plus MP3, AAC and FLAC music files are supported. There are front and back cameras - 8MP with flash, and 2MP - a USB input and a microSD card slot, plus WiFi and Bluetooth connectivity. Set to be available in 16 and 32GB incarnations, a release date and prices are yet to be confirmed.